& see other great Monticello creations. If you don't have art for the window, MenuCoverMan is happy to create exciting, beautiful & elegant art for you- FREE. 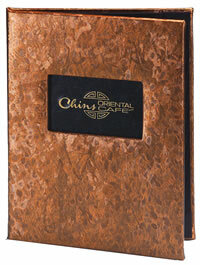 You've been there yourself.. a server hands you an impressive, substantial & beautiful custom menu cover. It's obviously been envisioned with care, designed professionally & executed with elan. You remember it as you go about your day. Monticello is that menu cover. Casebound. Specify padded or hardback. A die-cut window opening smartly & dramatically displays your chosen photo image. 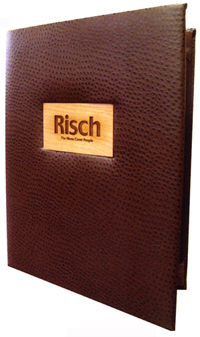 Custom imprint on material, or laser engraving on wood. Album style corners. Custom window sizes are available, up to 25 square inches; please call for details. 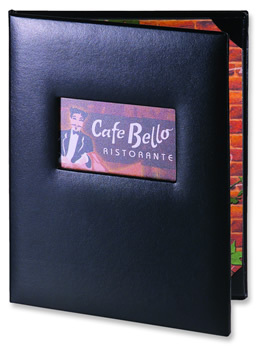 your own custom die-cut menu cover! Obtain your base price by choosing.. 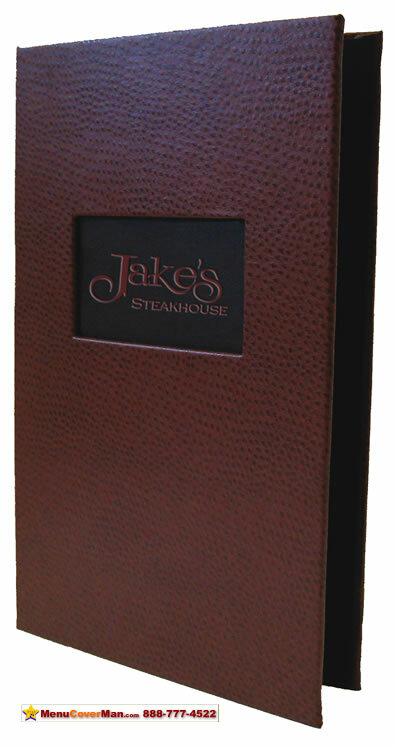 Example using Jake's Steakhouse shown below. • Base price code: CH-2V-8.5X14 $31.76. • Window option "C" imprinted material. Code: MON-DE: Add $10 per cover to above pricing. 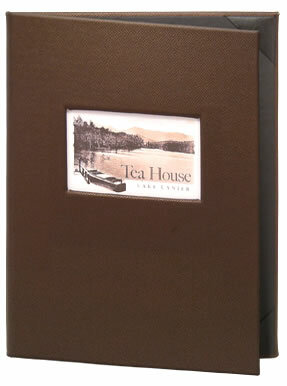 • Black Tuxdeo Window Material with Maroon Foil Logo: $85 one-time die charge. Select one of these 4 window options. Option "C". See more samples below. 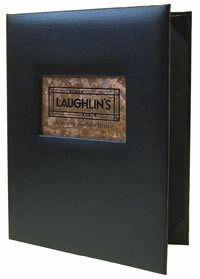 for 8-1/2" x 11" or 8-1/2" x 14" covers. for 5-1/2" x 8-1/2" covers. for 4-1/4" x 11" or 4-1/4" x 14" covers. Your benefit: • A photo image is set permanently in the die-cut window with a matte overlay. Add $10.00 per cover to the price of the cover selected in Step 1. B) Pocket for Removable Photo Image. Your benefit: • You choose your own photos and insert them into the cover (8-1/2" x 11" or 8-1/2" x 14" inches only) with a template- provided at no cost- that allows you to change the image in the die cut window periodically. Add $15 per cover to the price of the 8-1/2" x 11" or 8-1/2" x 14" selected in Step 1. Your benefit: • Foil stamp or blind deboss in the die-cut window any material color shown on the MenuCoverMan.com website. D) Laser Engrave on Wood. Your benefit: • Laser engrave a logo in the die-cut window on authentic wood. Add $20 per to the price of the cover selected in Step 1. More Samples! Click images below..  Please click the image to see all the realistic enlargements.